On the other end is a panicked response of "FIRE!" Moments later you don the protective suits that will deep you alive, gather your equipment and rush to the scene of a blazing inferno. You must face your fears, never give up, and above all else work as a team because the fire is raging, the building is threatening to collapse and lives are in danger. You must succeed... lives are on the line! 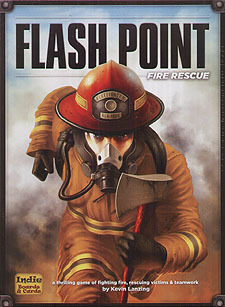 Flash Point: Fire Rescue is a cooperative game that is fun to play with friends and family. All the players are on the same team - everyone either wins or loses together. With four levels of play (Family, Recruits, Veteran and Heroic) there is a challenge appropriate for players of all skills and ages. Flash point is one of the first cooperative games that I played when I got into gaming. A great cooperative game where you are the fire department, each player has a different role to play in the game. The aim of the game is to save 8 people and not let the building collapse. Sounds easy right? This game can be brutal. The person of interest markers could be blank, the fire spreads after everyone's turn. I really enjoy this game and it doesn't hit the table as often as it should.